I am debating when it is that I will hit the road, today, tomorrow? Not sure, let us see how things feel as the day goes. Maybe I’ll start putting away a few things and see how that feels LOL. I can’t just plan something ….. The notion to do it has got to be right, got to have the urge! I got a couple of things done after getting here, one; I picked up a new vent for my RV and replaced the broken one, and two; I broke over and brought a propane tank so now I have an extra one again. With the cold weather coming it will be good to have the spare tank. I kept waiting to run into a deal but I had no luck on that 😦 I am sure now that I have one I will find them all over the place! LOL. Also today I went online and paid my bills for the month, that is always fun ……….. not!!! The trip to Joshua Tree was a nice little trip and was something different to do, now what? Tomorrow I need to do a few chores, like my laundry and maybe look around for some good plywood to finish the solar panel job. 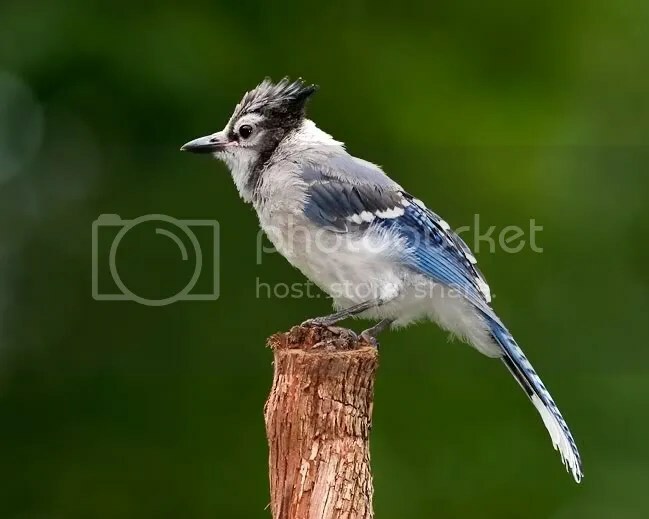 Here is the new bird of the week, this is a young Blue Jay and the picture was taken in KY. Thank you Kidazzleink, One, for reading and looking in on my blog and two, for nomination. However ……….. I am so sorry, but I am going to pass on this. I write my blog for my own record mostly and I do enjoy readers coming by but I don’t want to do this reward thing. Again thank you so much for the nomination, but no. I hope you do well with it.